Are you aged between 13 and 19? Do you have a desire to be the next NFL star, or just want to try out something new? If so, why not join the Essex Spartans Academy? We are building the foundations for our youth and junior teams and we want you to help us! At the Spartans, we consider ourselves to be an inclusive club with a family atmosphere and younger players have the same pride in the club as senior players. When you join, you will soon learn what it means to be a Spartan and forge strong relationships with your Spartan brothers! 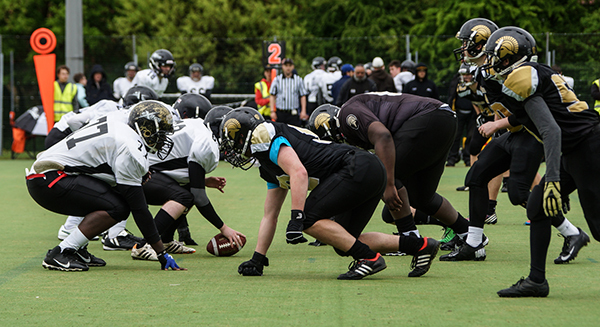 The two formats we compete in are 5-on-5 full contact for under-16’s, and 9-on-9 full contact for under-19’s. We participate in League play at both levels. This format is for those aged 13-16 and is played on a smaller pitch with 5 players per team. It’s a fast paced version of the game where the hits are just as big! This format of the game is for those aged 16-19. It’s almost identical to the 5-on-5 format but played on a larger pitch and with more linemen. Annual registration with the British American Football Association is currently £20 for the U17 team, and £25 for the U19 team. Additionally, there is an annual subscription of £140 to be paid to the Spartans which is paid online using our GoCardless system (details here). Come down to a training session! Before you attend your first session, please make sure you complete one of our insurance waiver forms, which can be found here. This form must be completed, and signed with parental consent, and covers you for your first three sessions with the team. Please make sure you bring it with you when you first attend. These first three seasons are COMPLETELY FREE, and are aimed towards allowing you to get a feel for our sport, and us as an organisation, before you decided to sign up! For your first session, you’ll need to bring a gumshield, a completed form, a gumshield, plenty of water, a gumshield, clothing suitable for exercising outdoors, a gumshield, footwear suitable for either astrotruf or grass, and, did we mention a gumshield? We provide you with a helmet, shoulder pads, and training jersey, and we will provide you with details of any additional equipment you’ll need to purchase yourself should you decide to sign up with the Academy. Sounds great – when can I come down? We hold training for our Youth team on Fridays at Thames RFC, with equipment allocation from 7:00pm and training then running from 7:30pm – 9:30pm. Our Junior team train Sundays at Thames RFC, starting with equipment allocation from 10:00am, with training them running from 10:30am – 1:00pm. Check our main page, under the “Coming Events” section, for full details and to see when our next session is. I’ve completed my first three sessions, how do I register with the League? 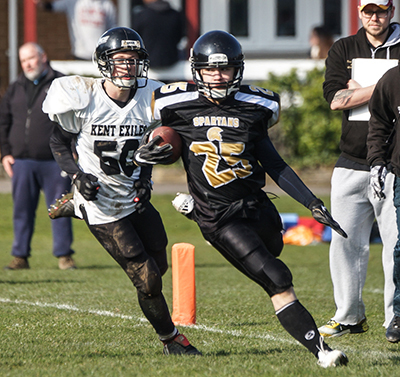 Once you have completed your first three sessions and have decided to continue, you must register with the BAFA League. You can do so by clicking here. Helpful guides have been created by the League – you can find a guide for creating a new registration, and for renewing your existing membership. Also, please don’t forget to complete your Player Information Pack (link) which should be returned to the Spartans at training. I have some questions I’d like to ask before I come down? If you have any questions, feel free to complete the contact form. Come on down and be part of something big! We’re also looking for volunteers to help out at the Academy – ever fancied your hand at coaching, or do you have another skill or talent you think would be of use? Please contact us and get involved!